Many people want to try their hands at photoraphy but they are discouraged since taking graet pictures requires intensive practice, which can be very overwhelming for many beginners. With the Tabletop Photo Studio, beginners can improve their talents in making great shots – within the comfort of their homes. The studio is ideal for those planning to sell something (jewelry, gadgets, or collectibles) over the Internet. The controlled environment it offers allows users, both amateurs and professionals, to capture a very clear image of the object. The Tabletop Photo Studio provides optimal lighting and clean backgrounds, enabling you to make studio-quality photos with the use of even the simplest camera. 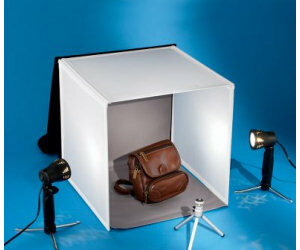 It comes with two backdrops providing different levels of contrast for light and dark objects. The studio is composed of a compact light box, a tripod, an integrated diffuser screen, and two high-output lights that have adjustable and retractable legs. Measuring16-in H x 16-in W x 16-in D, the set only weighs 4 ½ lbs. Basically, online consumers are attracted to high-resolution photos of objects being sold. This means higher chances of selling the products for a high price. In addition, having a high-quality picture photo could definitely facilitate the insurance process (usually, insurance documents require proof of some products). The set gets a plus point for ease of use and portability. You can easily store the set as you can fold the backdrops. The set also includes a built-in carrying case and a handle. Available for $79.95 from Hammacher.